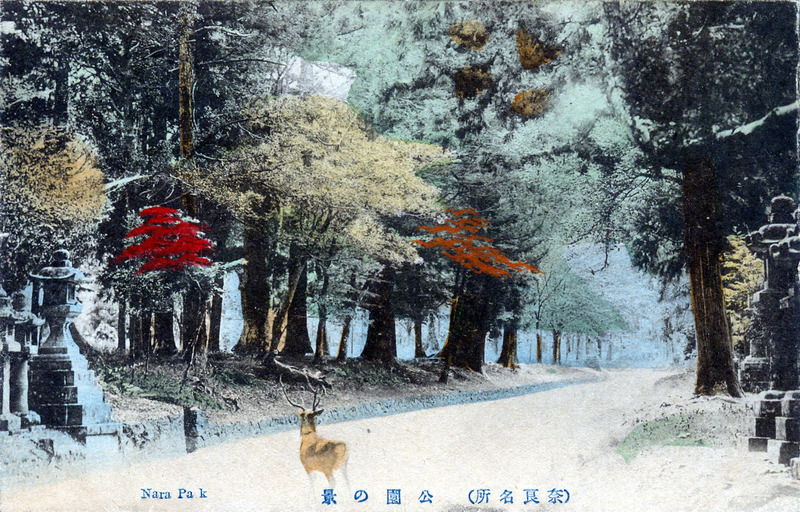 Wild deer at Nara Park, Nara, c. 1910. 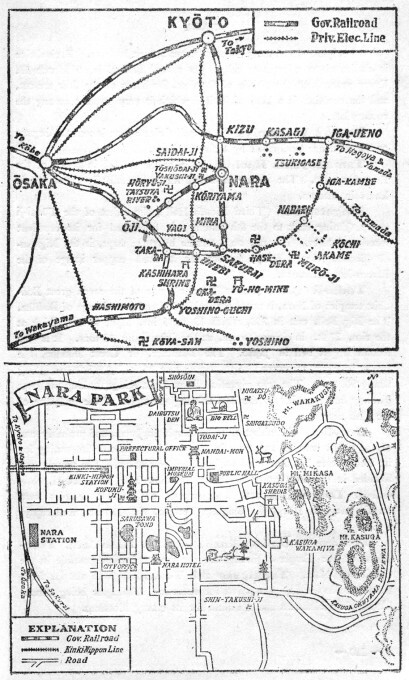 “Nara Park, a magnificent stretch of woodland comprising some 1250 acres, on a gentle hill-slope [in Nara], crossed and re-crossed by noble avenues overhung with lofty evergreens and deciduous trees of many varieties (cryptomerias, pines, oaks, plums, Salisburias, etc. ), is perhaps the finest cultivated park in the Empire. “These superb trees (60 or more of which were unfortunately wrecked by the devastating typhoon of Sept., 1912), are interspersed with fine old cherry trees which are a glory in April, and maples which are of such unexampled beauty in Nov. that thousands of pilgrims repair hither to drink in the beguiling beauty of the sight. The underbrush beneath the forest monarchs has been cleared so that the rich greensward comes up to the very trunks and makes one think of a well-kept English park or a stretch of cultivated woodland in the Blue-grass region of Kentucky.